We are delighted to announce details of our lunchtime seminars this term. Both seminars start at 1.00pm; speakers will present on their research for 25-30 minutes with time afterwards for informal discussion. Lunch is provided. The seminars are free to attend, but please email Jennifer Wallis to reserve your place. Seminars are held in the Senior Common Room on the 4th floor of Arts Two (building 35 on this map). Thursday 21st November. Helen Rogers (Liverpool John Moores University), ‘Convict Tattoos: An Intimate Reading’. On arrival in the penal colony, Van Diemen’s Land, convict exiles were grilled about their offending histories, occupations and family ties while their bodies were inspected for distinguishing characteristics. 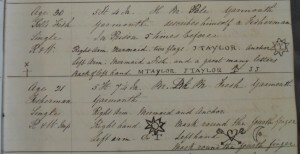 The resulting convict indents thus preserved the penal state’s biographical record on each offender with snatches of their responses to interrogation. Unwittingly, however, the authorities also captured an alternative form of personal testimony by transcribing the tattoos with which many convicts had adorned their bodies. This paper proposes a method of ‘intimate reading’ using multiple record linkage to decode the symbolic and emotional worlds of the convicted via their tattoos. Immersive reading of this kind can help us reconstruct the agency and sensibility of those who have left few traces of personal testimony but whose behaviour was captured in abstract information garnered by officialdom. The paper focuses on convict men sentenced at Great Yarmouth in the 1830s and 1840s, and argues their elaborate tattoos spectacularly depicted the men they felt themselves to be. 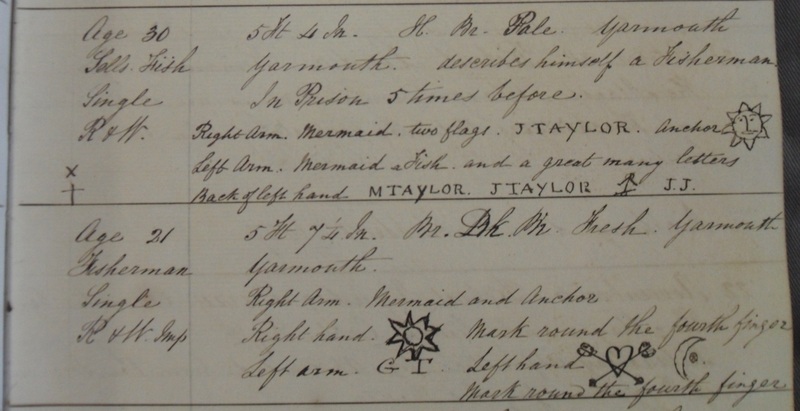 As in the sign of the Hope and Anchor that many convicts wore, tattoos anchored the Yarmouth men in the life they had known – their loved ones, trade, sports and passions – as they entered an unknown land. Thursday 5th December. Carolyn Pedwell (Newcastle University; AHRC Visiting Fellow at QMUL), ‘Circuits of Feeling in The Age of Empathy’. With the rise of the ‘science of empathy’ in the wake of the discovery of mirror neurons, we have seen a veritable return to biology, ethology, neuroscience, genetics and various evolutionary theories to explain not only empathic circuits of feeling within the human body, but also the emotional politics of contemporary societies internationally. This paper grapples with the implications of the multiple layers of translation involved in politicising the science of empathy. Through a critical reading of the leading primatologist Frans de Waal’s bestselling book, The Age of Empathy (2010), I explore how the translation of scholarly scientific research on empathy into the language of popular science often involves establishing links between the biological workings of the individual organism and the health of the body politic. While authors like de Waal aim to keep biology separate from ideology, culture and politics, their own scientific claims work to support a political vision premised on a version of empathy that correlates with neoliberal capitalism’s demand for an enterprising and emotionally adaptable citizenry animated by self-interest and self-responsibility. As the paper argues, however, this is not the only possible or plausible translation of science of empathy. I explore how the circuits of feeling de Waal describes might be interpreted in ways that contest, rather than uphold, biological essentialism and disrupt, instead of solidify, the oppressive logics of contemporary forms of neoliberal governmentality. Indeed, when read against the grain, particular strands of contemporary neuroscience and ethology might productively complement critical cultural, political and psychoanalytic analyses of emotion and affect, contributing to a framework for conceptualising affective translation that is critically attuned to the links between empathy, materiality and power transnationally. This entry was posted in Art and emotion, Politics of Emotion, Queen Mary Events and tagged art history, empathy, lunchtime seminars, tattoo history by Jen Wallis. Bookmark the permalink.